Glen Raasch's coach at Mt. San Antonio College assessed Raasch's pro chances in 1988 to The Los Angeles Times. "He's a prospect," Art Mazmanian told The Times. "He has the size, strength and he works hard. He needs some work throwing the ball from behind the plate, but he has a chance." Raasch took his chance to the pros a year later. He played in five seasons. He briefly made AA, but couldn't take his chance to the bigs. 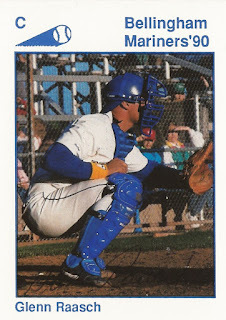 Raasch's career began in 1989, taken by the Mariners in the 39th round of the draft out of Mt. San Antonio. Raasch's name has also been spelled Glenn Raasch. At Mt. San Antonio in 1989, Raasch hit .303, with eight home runs and a second-team all-conference selection. He also played the summer of 1988 in Alaska with the Goldpanners. He started with the Mariners in the rookie Arizona League. He hit .223 in 45 games. He then moved to short-season Bellingham and high-A Peninsula. He hit .177 in 52 games overall. Raasch saw limited time in 1991 at Peninsula and high-A San Bernardino. He saw 22 games in all and hit .111. He then missed all of 1992. He returned in 1993 with the Cubs at single-A Peoria and AA Orlando. He saw five games at Orlando and went 3 for 14. Raasch saw his final pro time in 1994 at Peoria and in the rookie Gulf Coast League. He hit .234 in 27 games to end his career. Raasch has since gone into baseball instruction with West Coast Baseball School in North Hollywood, Ca..